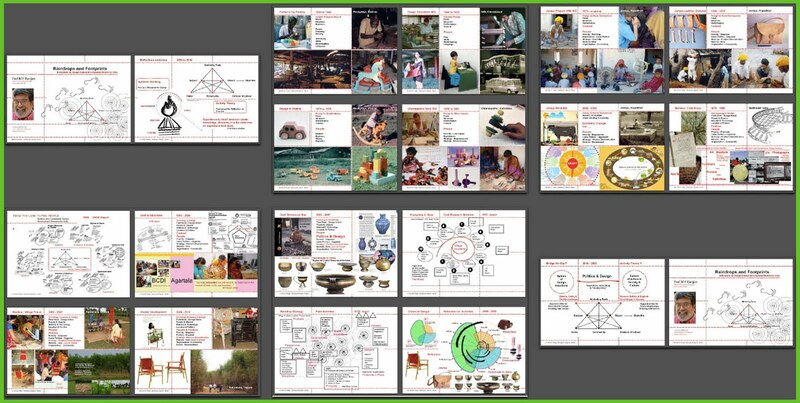 Raindrops & Footprints: Reflections on Design enabled development models for India. Image 01: Screen shots of the visual presentation used to support the keynote lecture at the FISCAR 2010 conference in Helsinki. The author has been a design teacher at the National Institute of Design from the early 1970’s and has been involved in the teaching of design theory as well as conducting design research in the areas of industrial design for development with numerous experiences in the small scale and craft based production situations in India. Much of his professional and educational initiatives are focused on using traditional craft skills that are an abundant ability in India as a development resource that could address severe problems of poverty and unemployment in vast areas of rural India. 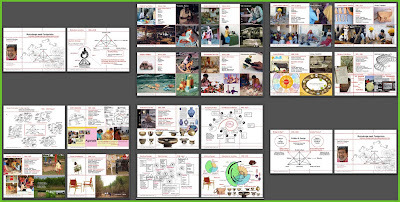 Each design project experience conducted over the years offered new insights into the complex problems that were being faced by professionals trying to intervene in the sectors of need in India and these insights were translated into visual models that were used to inform students as well as future initiatives in these sectors. The subject of this conference gives us the opportunity to reflect on these series of insights and to map out the contours of the theory of design based crafts interventions that emerged from the National Institute of Design over the past 50 years of exploration and design action in the field. The author’s personal background of having been born into a family of a craftsman carpenter who later built his business enterprise in the manufacture of wooden toys and furniture for children provides an extended backdrop for this investigation and reflection into the models for development that emerged and were tested through repeated interventions in the field. These refined and partly validated models are offered here with historical and personal references to the numerous projects that helped shape the insights and the specific models of development that have gone to create the “Macro – Micro Strategy for Development” that has been used to build a sustainable village based enterprise that is currently in progress as a test case in the bamboo based enterprises in the State of Tripura in Northeastern India. Each project experience brought in specific insights that are expanded and detailed to give a framework for the theory that has informed our actions over the years. Learning from the field has been a much repeated mantra at the NID and its education slogan has always been “learning by doing” which in turn meant that those of us who lived and worked at the Institute were privy to hundreds, if not thousands of individual projects, all of which brought back fresh insights that we hope these reflections will reveal at least in part. There is an underlying theory that emerged and it will the attempt of this paper to try and articulate some of the contours of this theory by using the models that have emerged over the years and those that were used in the classes through which generations of NID students have been trained. The paper will be supported by specific case studies to summarise the progressive findings from the field based experiences and the intermediate and cumulative strategies that were adopted for the numerous field based interventions carried out by the author and his colleagues at NID in the area of design for development. The paper will be accompanied by a visual presentation that would provide visual evidence of the context as well as the design offerings and alongside this will be the theory and the models and strategy diagrams that emerged as an outcome of these investigations, specifically those that were used to advocate future action in the field.